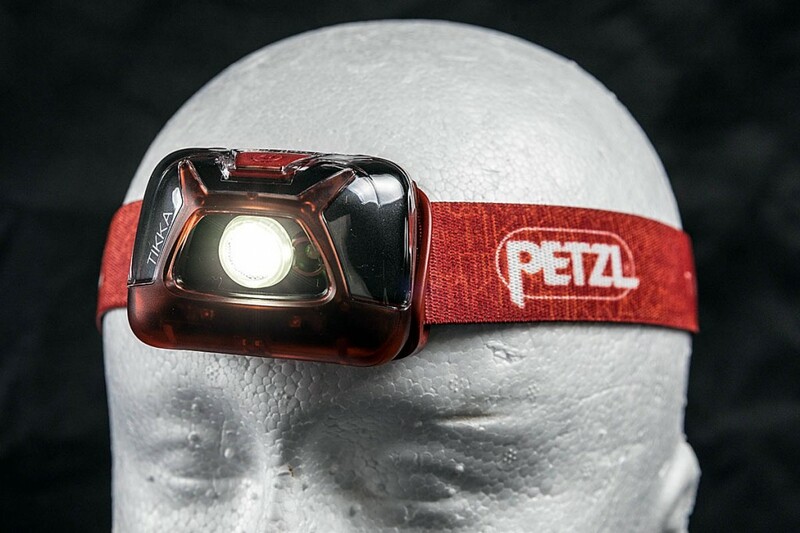 A headtorch should be in every outdoor enthusiast’s kit. The ability to light your way when it gets dark could mean the difference between getting stuck on the mountain and being able to make your own way off if you get benighted. 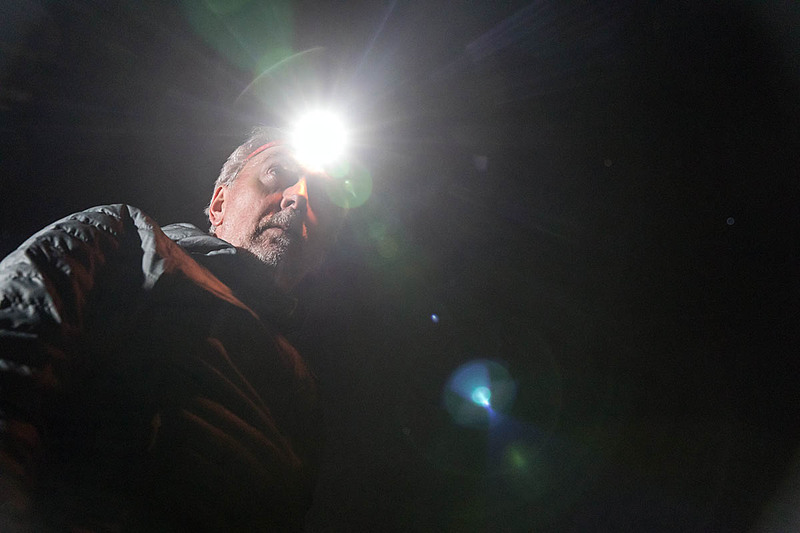 Mountain rescue teams repeatedly plead with walkers and other hillgoers to carry a torch with them. A headtorch frees up your hands so you can find the holds on rocky ground, or use poles, a compass, map and all the other items you need to progress in the countryside. But a torch isn’t just for emergencies. Learning to navigate a night opens up a whole new area of opportunities to explore the outdoors. A headtorch should provide good illumination for your activity, whether it’s walking, running or biking. It should be comfortable to use and should have protection against the elements. We pulled on out boots and warm jacket to put nine headtorches to the test in the dark outdoors. Some of the torches in our test use rechargeable batteries; others use alkaline power. The advantage of rechargeables are obvious, but they do tend to lose power quickly at the end of their charge. Alkaline batteries are less susceptible to his but work out more expensive overall. Some of the torches can be used with either power source. Some can also be used in other ways than on the headband, giving them more versatility. Prices range from budget models to more expensive torches. Choose a model that best suits your activities and price range. The ReVolt is supplied with a set of three AAA Black Diamond ReVolt rechargeable NiMH batteries, which you have to use if you want to charge the torch up with the batteries in the unit. However, these can be swapped for lithium batteries or non-rechargeable alkaline ones, the latter of which are needed to give the full 300 lumens power. The headtorch has a battery indicator at the top of the housing, with green meaning there’s 50 per cent or more charge; orange between 25 and 50 per cent; and red less than 25 per cent. The ReVolt has two white LEDs, the main one giving the brightest illumination in a concentrated beam, with a smaller LED giving a less intense, wider light useful for proximity work. You press the main switch on the top of the torch twice to toggle between the two. On the right side of the unit is a ‘power tap’ which, when pressed briefly, turns on both LEDs for maximum output. The main LED and the smaller one can both be dimmed by holding down the main switch until the required brightness is reached. The light flickers at the maximum and minimum levels before continuing to cycle through the power if the switch is held down. Holding down the switch for two seconds turns on the red LED. Tapping the switch three times engages the strobe mode. The Black Diamond headtorch has a brightness memory, which means it will turn back on at the brightness that was set when it was turned off. The Black Diamond ReVolt is rated at IPX8 which means it will resist being submerged in 1m-deep water for up to 30 minutes. However, it will be necessary to dry out the battery compartment afterwards if water has got in. The headtorch comes with a micro USB charging lead, which plugs into a socket on the side of the unit. When not being charged, a rubberised cover keeps out the weather, but on the sample we had, it was impossible to re-seat the plug adequately, meaning the socket was vulnerable to the weather and the cover stood a little proud at one side. The headband is a single elasticated one, with buckles either side for length adjustment. The housing has four click positions from horizontal to direct the beam downwards. A full recharge of the included ReVolt batteries will take between four and five hours, using the micro-USB lead supplied. A small indicator light flashes while charging and stays steady once full charge has been achieved. The main white LED produces a beam between 175lm and 40lm when using NiMH batteries, with the smaller LED giving between 70lm and 6lm. With non-rechargeable alkaline batteries, the corresponding light levels are 300lm-45lm and 60lm-6lm. Burn times with maximum power from the large LED are six hours with NiMH and 30 hours with alkaline. Rated maximum distances for the main beam are 68m and 80m respectively. In practice, we found those distances about right. The smaller LED is useful when pottering around the tent during camping when the power of the larger light is not needed, and this will prolong battery power. Finding the right place on the side of the housing to turn on the boost mode was sometimes a bit hit and miss and, to be honest, we seldom felt the need to use both LEDs at once, the main light giving plenty of illumination at full power. The beam was good, with a concentrated central area but with just enough peripheral light to help foot placement. The headband was comfortable, with simple length adjustment. The ReVolt is a competent all-rounder with the useful attribute of taking spare alkaline batteries if the rechargeable ones become exhausted. Just remember to pack those spares. The Blue Mountain headtorch is a simple, lightweight unit that comes with three alkaline batteries. The Night Vision has a single elasticated headband with length adjustment via one buckle. The housing has four click stops down from horizontal and, unusually, four upward ones too, so the beam can be pointed above horizontal. Operation of the torch is via a single push button on top of the housing. Push it once for full power, a second time for 50 per cent and a third time to turn on the smaller red LED. A fourth push turns the unit off. The 3W Cree white LED give a maximum output of 120lm at full power. The Blue Mountain unit will last for 4½ hours until exhausted and is rated at IP54 for water resistance. The Night Vision is the simplest and lightest headtorch in the test and also had the most competitive price. In use, the Night Vision gave about 40m of illumination at full power, and about half that distance on its lower setting. The red LED gave only enough light for reading. The headband and housing were fairly comfortable, though there is no padding on the back of the housing. 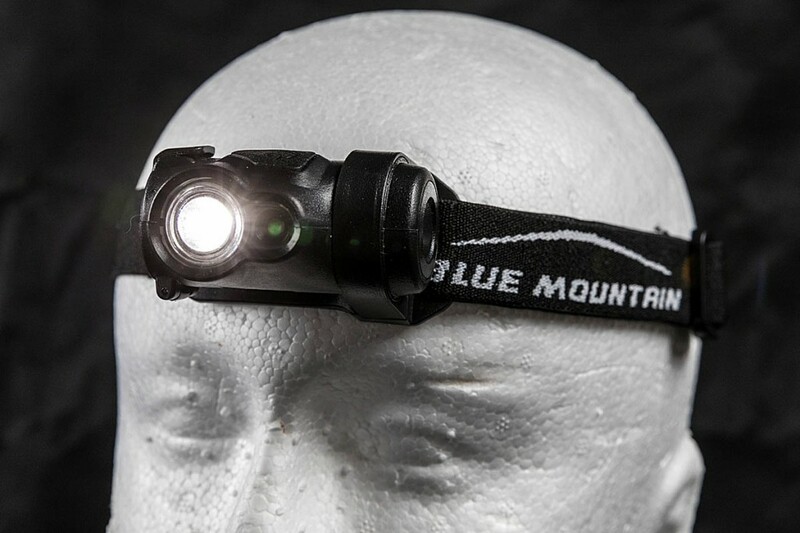 The Blue Mountain unit is a simple headtorch suitable for occasional users, at a competitive price. If you only rarely head into the countryside after dark and don’t want to spend more than necessary on a torch, the Night Vision will do the job. It’s simple and will light the way for your walks though we wouldn’t recommend it for serious night navigation away from paths. The Blue Mountain headtorch was supplied by Cotswold Outdoor. The snappily titled Xplor PHR15 comes with three of GP’s AAA ReCyko batteries. It can also use alkaline power, useful if you’re out over a long period and are worried the rechargeables will become exhausted. It has a single elasticated headband with a reflective strip through it, and the housing has three downward click positions from horizontal. Charging is via a micro-USB socket on the side of the housing, which is covered by a rubberised plug. The GP Xplor is rated at IPX6 for water resistance. The PHR15 has a single Cree LED which delivers a bright central spot and a dimmer surrounding wide beam. The unit has a single push-button switch on the top. Pressing it once turns on the headtorch at full power. A second click reduces the brightness to medium; a third push drops the brightness to low, with a fourth switching the unit to flashing mode at full power. To turn the headtorch off, you press the button one more time. While the unit is turned on in any of the modes except the strobe, holding down the button switches it to its distance sensor operation. 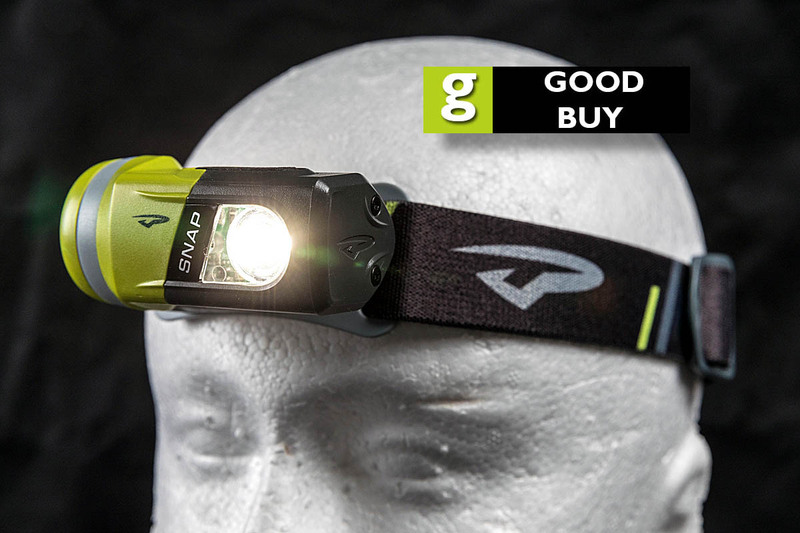 Using two light sensors either side of the main LED, the GP headtorch will adjust the brightness according to surroundings. When directed at distant objects, it will provide full power. When working close by, for instance map reading, it will automatically reduce the power. When in this mode, a red indicator glows within the button to indicate the sensor function is engaged. With the unit turned off, holding down the button for five seconds locks it, with a double flash indicating the lock is on. Pressing the button while the torch is locked prompts a single flash. Holding the button down for five seconds again turns it back on. At full power, the PHR15 delivers 300lm of brightness, with a burn time of five hours. The medium setting delivers 150lm for a maximum of eight hours. The low setting produces 5lm for 69 hours. GP rates the unit for 157m illumination at full power. 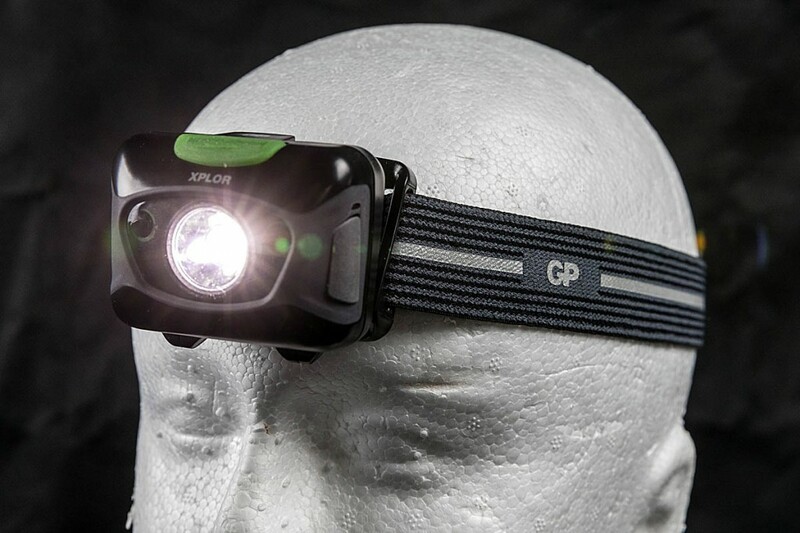 The GP headtorch is resistant to being dropped from up to one metre. Out on the hills, the PHR15 gave a good illumination, reaching to about 90m on full power. The lowest power setting gives enough light for close activities such as map reading or providing illumination inside the tent. On the sensor setting, the GP headtorch had a tendency to cycle between reduced power and full power more than we would expect. The main beam had a good illumination, picking out crag detail at some distance. The headband was easily adjustable and was quite comfortable. The GP PHR15 packs a lot of power for a very competitive price. Although the distance sensor worked well at reducing brightness when reading close by, it was less assured when directed at the distant trail. The medium-brightness setting is useful for conserving battery power, while still providing adequate illumination to the mid-distance for walking. The ability to use alkalines is also useful if heading out on a longer journey when the rechargeable batteries may become exhausted. Just remember to pack them in your rucksack. Modes: high, medium, low, strobe, red LED. White boost. The LED Lenser headtorch comes with a rechargeable li-ion battery pack that slots into the main housing by prising the housing from its sprung plastic mountings and then opening the clip to reveal the compartment. The fittings feel robust and fasten securely. Once installed, the battery pack can be charged via the supplied lead, which is a good length – 125cm – with a USB plug at one end and a custom magnetic plug at the other, which attaches to the underside of the housing. A red light on top of the torch indicates it’s charging, turning green when full capacity is reached. The LED Lenser headtorch is quite beefy and has a top elasticated strap that goes over the head, in addition to the normal elasticated headband. Both are adjustable for length via plastic buckles. The lamp housing can be tilted downwards in a stepless fashion. The MH7 has two LEDs: a main white one and a red one adjacent to it. Clicking the switch on top of the unit turns the torch on in low setting; a second click switches it to medium power and a third puts the LED Lenser torch up to full power. Clicking a fourth time turns it to flashing strobe mode. In any of the settings, including when the torch is turned off, clicking the switch twice in rapid succession puts the torch into boost mode, providing maximum power; useful if you need to briefly pick out distant features. Holding the button down for three seconds switches on the red LED and vice-versa. Pushing the switch for five seconds locks the unit, indicated by a rapid blinking four times of the red LED. To unlick the torch, you hold down the button for three seconds. When you turn on the torch, an LED on top of the unit gives a brief indication by colour of the charge of the battery: green for good charge; yellow for half-charged and a red light indicating it needs recharging. The lens housing in front of the white LED has a zoom ring. When rotated it changes the beam from wide to zoomed spot. In use, the LED Lenser headtorch was comfortable despite being the heaviest in the test. The top headband helps keep it in place and support the sturdy unit. At maximum power, the MH7 is very bright. The beam gives a very defined circle, even at its wide setting. When zoomed into its spot mode, it picks out detail at a distance of more than 100m on a clear night. If you want to preserve battery, its medium setting is still bright enough for normal use when walking. The red LED is actually bright enough to illuminate a couple of metres ahead while walking, as well as reading close items. At full power the MH7 is rated as lasing 3½ hours. At its lowest setting, which is OK for use in the tent or when working close by, it should last up to 40 hours. The LED Lenser torch is rated IP54 for dust and moisture resistance. The LED Lenser MH7 is well thought out and versatile. Design and build quality are very good. It’s a solid unit that should give good service both on the mountain and in the countryside for runners and walkers. Runners and cyclists will appreciate the long-distance illumination, though perhaps not the added weight of the LED Lenser torch. The Intensity 230 is a rechargeable LED headtorch that comes at a competitive price. Unit uses a micro-USB lead to charge via a socket on the side, which is covered by a tethered plastic plug, and has a charging indicator LED, which changes colour to green to show it’s ready to use. The Lifesystems torch has on Cree white LED and two smaller red LEDs. There’s one switch on the top of the unit. Pressing it once puts the torch into medium mode; a second click turns on full brightness, with third and fourth pushes bringing low mode and flashing mode respectively. To switch between white and red LEDs and vice versa, you hold down the button for two seconds. The Intensity 230 first displays steady red, then flashing, then an SOS signal: three short flashes, three long, three short, rather than the accepted outdoors distress signal of six long flashes. The housing of the Lifesystems torch has four downward click positions. Its elasticated headband is fairly comfortable and held the torch in position. It has a single plastic buckle length adjustment. In use, the torch reached about 75m in high setting. The beam is nicely focused. In low setting, it’s only of use for reading close objects or for lighting with a tent. The medium setting reached about 40m so could be used to prolong battery power when walking. The red LED isn’t particularly bright so is useful only for reading. On its low setting, the Lifesystems torch batteries will last up to 110 hours before needing recharging. At the higher settings, this will be considerably less. The Intensity 230 is rated at IPX6 for water resistance and should also survive a 1m drop without damage. The Lifesystems torch provides good illumination at a competitive price. The Intensity 230 will light up your trail for walking and is a competent addition to the outdoor kit of anyone who doesn’t want to spend on a more expensive headtorch. It provides good illumination with simple enough controls at a good price. The Olight headtorch has a separate battery pack that sits at the back of the head. This has a partly coiled cable connecting it via a USB plug and socket to the switch, which is on the left side of the headband. A further short cable connects the switch to the LED unit itself. The actual unit is quite small, and has two LEDs, one giving a focused spot and the other a wider beam. Putting the battery at the rear makes for a much lighter front unit, which means there’s less tendency for it to slip down when running. There’s no switch on the LED unit itself, as the Olight is turned on by pressing the button on the switch unit, which is positioned about the temple area of the head. Pressing it once turns on the unit at full power, with both LEDs illuminated. A second press turns the torch on to its lower power setting. Pressing the switch twice rapidly turns off the spot, leaving just the wide LED lit. A second double click switches the unit to spot only LED. In both of these modes, a single click on the switch drops the illumination to lower power. Pressing the button three times rapidly turns on the SOS mode, in whichever lighting type is selected at the time, giving three short flashes, three long and three short, repeatedly. The Olight is bright, and the combined LEDs give a very even coverage, both nearby and into the distance, but of course using them both together will exhaust the batteries more quickly. On full power, the beam reaches about 75m. On half power, illumination was about 40m. Charging is achieved by plugging the battery unit into a USB source, using the supplied lead. A small button illuminates the battery charge indicator, which has four LEDs which will in turn go out as charge diminishes. An audible beep sounds when the battery level drops to 10 per cent. An interesting feature of the battery arrangement is that, if the main unit becomes exhausted, you can plug in an external USB source such as a power bank to the switch socket to continue using the torch. The elasticated headband is backed by a soft-feel tricot material and there’s added padding at the back of the LED unit. The unit itself tilts both up and down to a full 90 degrees in a stepless motion. 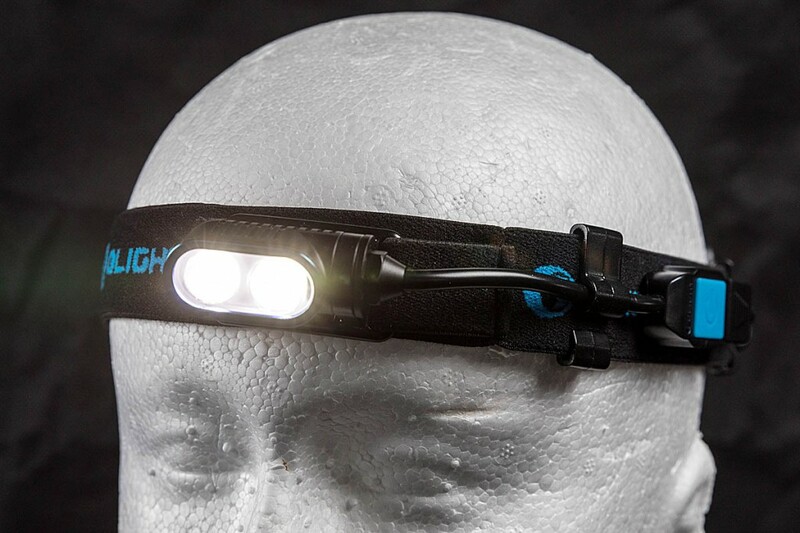 Olight says its HS2 headtorch is designed with runners and extreme sports enthusiasts in mind. Its aluminium alloy LED unit construction makes for a lightweight torch at the front of the head, with a well balanced battery pack at the rear. The headtorch stayed in place well during our outings. The side cable retainer need careful placement to ensure it doesn’t rub against the ear, but once that was done, the HS2 was comfortable in use. On low power, the Olight will run for up to 18 hours. On full, it will last two hours. Its wide beam gives a good near-to-medium distance illumination and the spot setting is good for making out distant features. It is nicely designed and quality is good. It will provide splash resistance to IPX4 and is rated to survive a drop of 1m. It comes with a storage cast and the HS2 is guaranteed for five years. The Tikka is one of Petzl’s simpler headtorches and comes with a set of three non-rechargeable alkaline batteries. It is also compatible with the brand’s Core lithium ion rechargeable pack which retails at about £24. The housing has four downward click positions and the elasticated headband also incorporates a low-profile emergency whistle into one of its buckles. The housing has a sturdy construction and the torch has one white LED and a smaller red one adjacent. Operation is straightforward. Pushing the button on top of the housing turns on the white LED at low power; pressing it a second time increases it to medium and a third time to full power. Holding the switch down turns on the red LED. A second press switches the red LED to flashing mode. A final press in either mode turns off the torch. It will also remember whether you were in white or red mode when turning the torch back on. On full power, the Tikka’s beam reaches about 60m; on medium power, the distance is about half that. The Petzl torch gives a nice even beam. The low setting is useful if reading in your tent or for close work. The red LED helps maintain your night vision and avoids blinding your fellow walkers if you’re doing close work together. It will illuminate about 2m of ground, so is mainly of use for close reading work. When the Tikka is turned off, a phosphorescent ring around the main LED continues to glow, which helps you find the headtorch if you’ve put it down in the dark or in the tent. The elasticated headband is comfortable, with a simple buckle to adjust length. The Tikka is rated at IPX4 for water resistance – it will cope with rain showers. Petzl says batteries will last for 60 hours at standard brightness. If you only use the low power setting, this rises to 240 hours, but bear in mind the illumination at that level is only 5 lumen, with about 10m of usable light. The Tikka is a lightweight, simple headtorch that is well made and a good general light for walking and running. It is well made and comes with a five-year guarantee. You won’t need a complicated manual to use this Petzl torch. The ability to take the optional rechargeable pack is an advantage, but it comes at a price that would bump up the total cost considerably, though it will give you the flexibility of using either rechargeables or alkaline batteries. The Princeton Tec is an impressively designed multi-purpose torch. 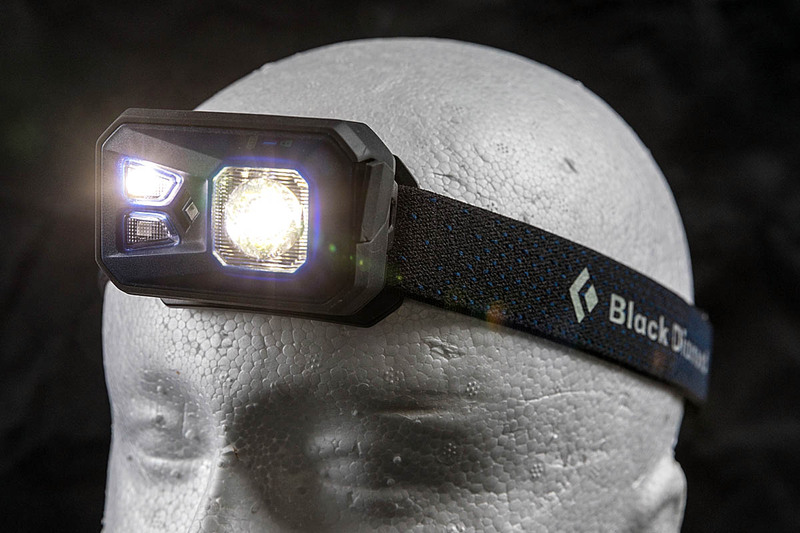 At its simplest, it slots into the headband housing to provide 200 lumen of power in a nice even beam. Clicking the top button once turns on the white LED at the front of the housing. If you hold the button down, it dims in constantly variable mode to its lowest setting before blinking briefly and increasing power again. Pushing the switch twice rapidly puts the Snap into flashing mode. As a headtorch, the Snap works well, with illumination reaching about 50m on full power. The elasticated headband is comfortable and the housing rotates downwards and fully upwards in a series of soft clicks. But Princeton Tec have produced a light torch that’s a lot more than just a headtorch. The main unit, which also contains the three supplied AAA alkaline batteries, is held into its housing by a strong magnet which attaches it firmly by one side of the unit. You can also use rechargeable NiMH batteries to power the unit in place of the supplied alkaline ones. The housing can be unhitched from the headband and it becomes a stand so the torch can be used as a standing light in the home or on the campsite. Remove the lamp unit from its housing and you can attach it to any steel or iron fixing in the home or on a vehicle to hold it in place. The Snap also comes with an extra magnetic housing that has plastic hooks on the end and at the side. Using the little plastic carabiner that it comes with means it can by hung either way to provide a lantern in the tent by hanging from a loop. The final housing that Princeton Tec provides is one for bike mounting. The lamp unit again snaps into a magnetic housing with a rubberised bracket section at the back. Two different sized plastic bungees allow the torch to be attached to bike handlebars and used either as illumination or as a safety strobe. All of which makes the Snap the most versatile torch in the test. As a straightforward headtorch for walking and running, it works well. But if you’re a cyclist or mountain biker, the Princeton Tec lamp will double up for use on your machine. It’s also easy to use in the tent and round the home. Batteries will last about 40 hours on the full setting and up to 130 hours when used at the Snap’s lowest power. The Princeton Tec headtorch is well made and will resist showers to IPX4 level. It’s a clever design and comes with all the accessories you need to use it in its various modes. 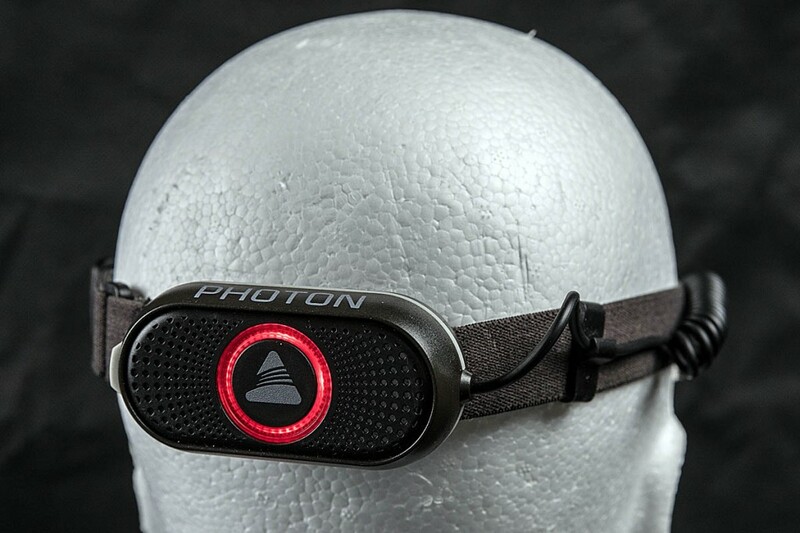 The Photon is another headtorch that has a separate battery pack at the rear of the headband. The sealed pack is recharged via a USB socket on its side and a partly coiled power lead supplies the main unit at the front. This is small and lightweight. The headband is fairly narrow but reasonably comfortable and has two plastic cable retaining clips down the right side. 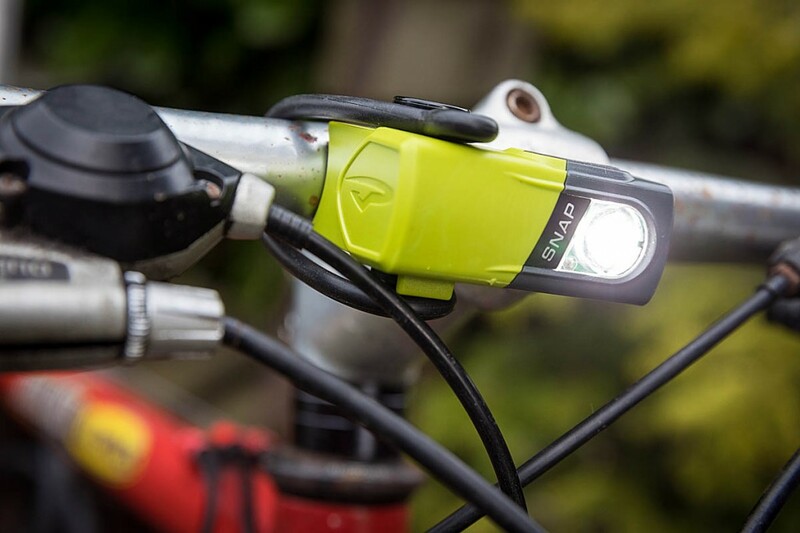 The lamp unit attaches to the headband via a slide-on clip, and the battery unit can also be removed from the band, so the torch can be used without the headband by clipping it on to clothing, rucksack strap or helmet. The lamp housing has five downward click positions for use while on the headband. A push-button on top of the unit turns it on. The first click gives low power, a second click full power and the third sets it in flashing mode. Pushing the button a fourth time turns on a small red LED, which is just bright enough to read by, but now to illuminate your route. The little light unit has a collimator LED that gives a good even light that reaches about 45m. At its low setting, the Vango headtorch picked out detail about 20m away. One novel feature of the Photon is its rear-facing red LED on the back of the battery housing. This is in a circle form and is switched on by pressing the Vango logo in its centre. A second press turns on the red strobe function. The rear red LED also serves as a battery indicator when charging. So the Photon can be used on, say a cycle helmet to provide a rear safety lamp, either constant of flashing, and front white light, again either steady or strobing. 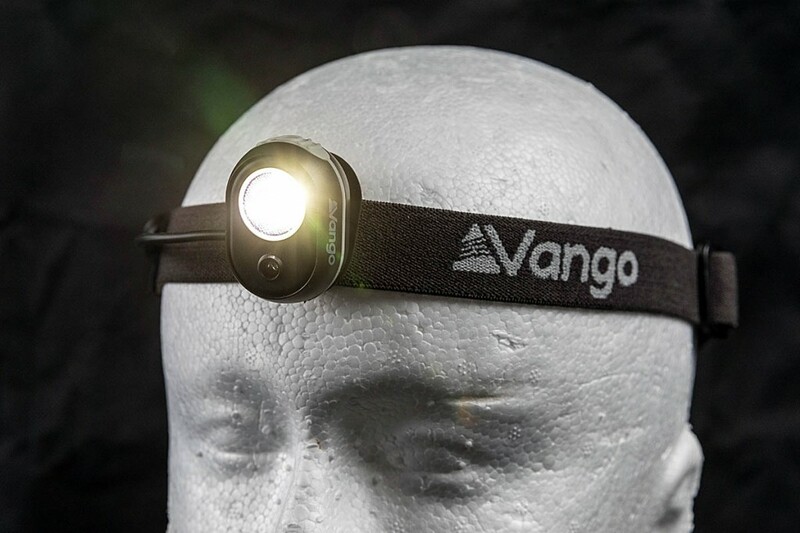 The Vango Photon is a neat, lightweight headtorch that packs a big punch for a little unit and is well balanced thanks to its rear battery unit. The ability to remove the light from the headband and the addition of the rear safety LED add versatility at a good price. 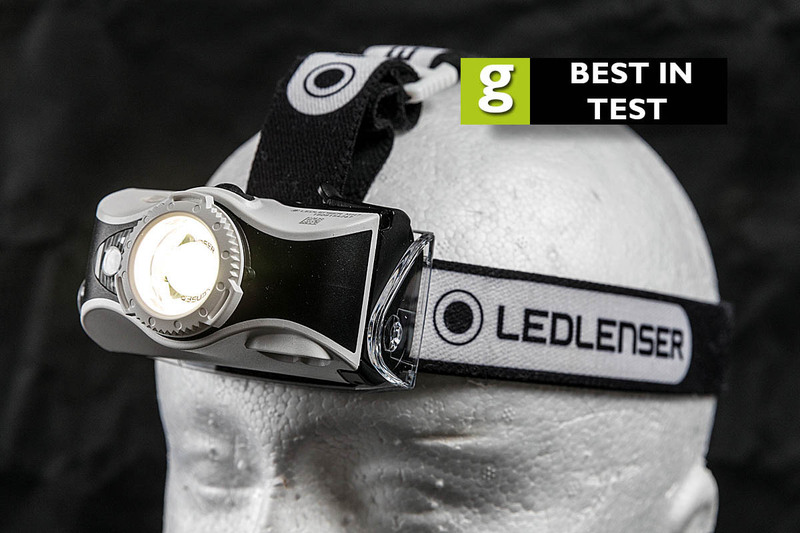 The LED Lenser MH7 topped our test. It gave a bright, adjustable light, was comfortable and quality was excellent. The Princeton Tec Snap’s sheer versatility made it a great choice, particularly for anyone who wants to use it for various activities. The Olight HS2 also provided a powerful beam in a compact housing with an interesting design. 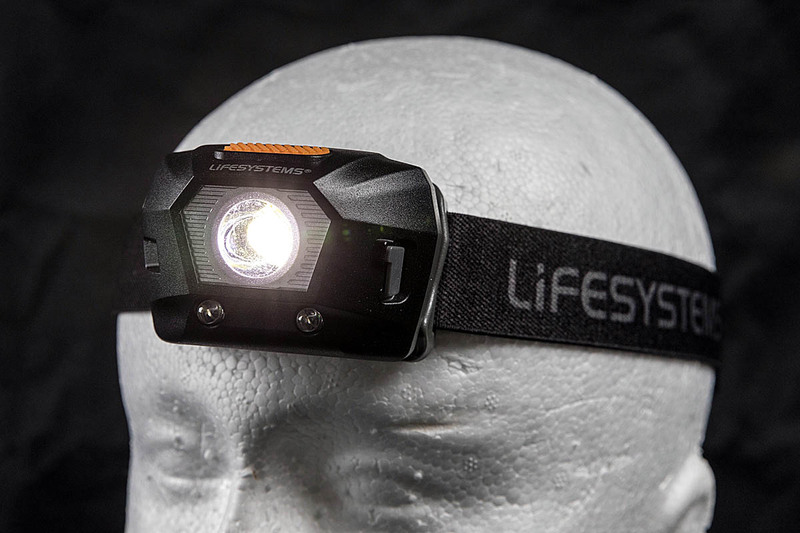 For those on a tighter budget, several of the headtorches are competitively priced and function well, but without some of the more advanced designs of the more expensive models. All the headtorches were supplied to grough by the brands.